Turning farther east to Silesia, we encounter a comparatively new German population. 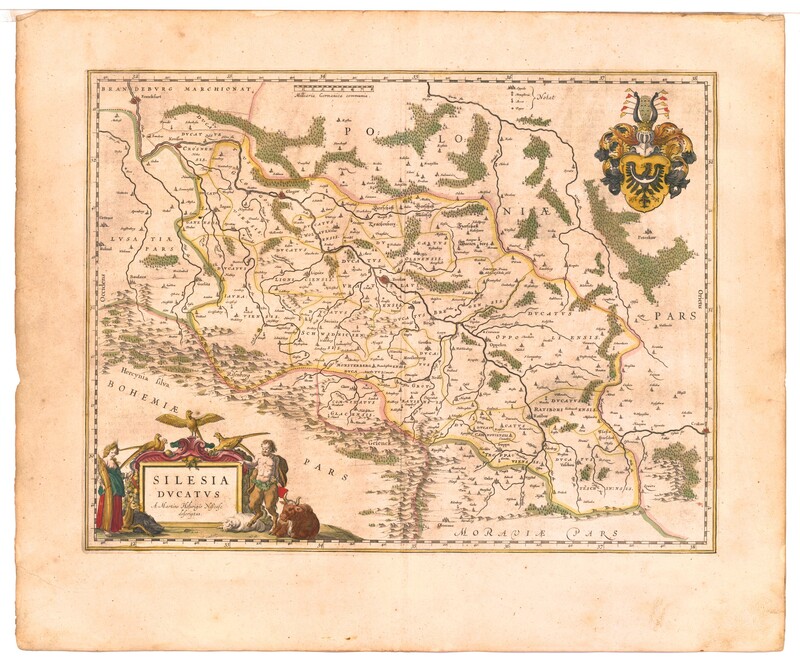 Silesia, overrun by the Slavs, was resettled by German colonists in the thirteenth century, and the colonists were mostly Thuringians and Upper Saxons, with a few from the Upper Rhine country ... They came from a region which is today largely Noric, Dinaric, and Alpine, but which at the time of their exodus was still considerably Nordic. A sample drawn from Friedersdoff in the Sudeten lands of German Silesia may be taken as typical of this eastern German population ... The stature is only moderate, with a mean of 166 cm. ; the head is of Alpine or Dinaric size and definitely smaller than those of North or West Germans, while the cephalic index of 86.5 is hyperbrachycephalic. The facial and upper facial indices are too low for Dinarics, and fall into an Alpine category; the noses, like those of the Bavarians, are usually straight in profile, and only moderately leptorrhine (N. I. = 67). Like the Saxons, these people are not infrequently blond. Medium brown hair is the commonest color; 20 per cent of eyes are brown, while most of the others are light and light-mixed. Northeastern Germany, from Mecklenburg over to East Prussia, is a region of great blondism, in which northwestern German types, especially the Borreby, gradually merge into the racial forms found in Lithuania and White Russia. Von Hindenburg, an East Prussian par excellence, was an ideal example of a Borreby-East Baltic combination typical of his own class and country. To summarize the data on the physical anthropology of Germany it seems necessary to stress the relative absence of conventional Nordics comparable to those found in eastern Norway, in Sweden, and in England. Such Nordics may be seen almost everywhere in Germany as individuals, but nowhere as a large element in the population. The Northwest Germans represent for the most part a reëmergence of Brünn and Borreby types which have absorbed the Iron Age Nordic group almost completely, as well as the old North German Corded concentration. The southwestern Germans are the most nearly Nordic of all, but have strong Brünn and Borreby accretions. The southern Germans, from southern Baden to eastern Bavaria, are basically Alpine, with strong, often predominant, Dinaric tendencies, and a large purely brunet minority. In central Germany an intermediate condition between the North German and the South German extremes is found. In southeastern Germany, from Saxony to Silesia, while the head form is extremely brachycephalic, the pigmentation is usually light, and the head size small in comparison with the northern and western parts of the country. The racial type which is most characteristic here is the Noric, a blond Dinaric form resulting from a brachycephalization of Iron Age Nordics through direct or indirect Alpine admixture. In Silesia, to the same elements may be added a broad-faced, snub-nosed, brachycephalic strain which we have already observed among Finns and Balts, and which will be studied in further detail in Poland and Russia. The northeastern Germans are for the most part blond brachycephals, varying in type from Borreby to East Baltic, and especially the latter. Some historians maintain that the area was inhabited by the Silingae, a Vandal tribe, from the 3d cent. B.C. to the 3d cent. A.D. Slavic tribes settled here c.A.D. 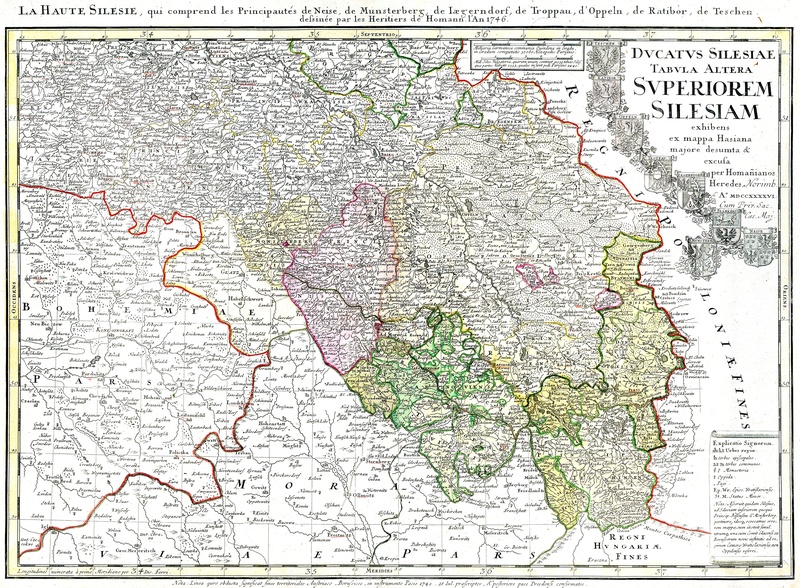 500, and Silesia was an integral part of Poland by the 11th cent. King Boleslaus III (reigned 1102–38), of the Piast dynasty, divided Poland into four hereditary duchies (of which Silesia was one) for the benefit of his sons. After 1200 the duchy of Silesia fell apart into numerous minor principalities. The Silesian Piasts encouraged German colonization of their lands, the larger part of which became thoroughly Germanized, and in the early 14th cent. the Silesian princes accepted the king of Bohemia as their suzerain and thus became mediate princes of the Holy Roman Empire. During the Hussite Wars of the 15th cent. 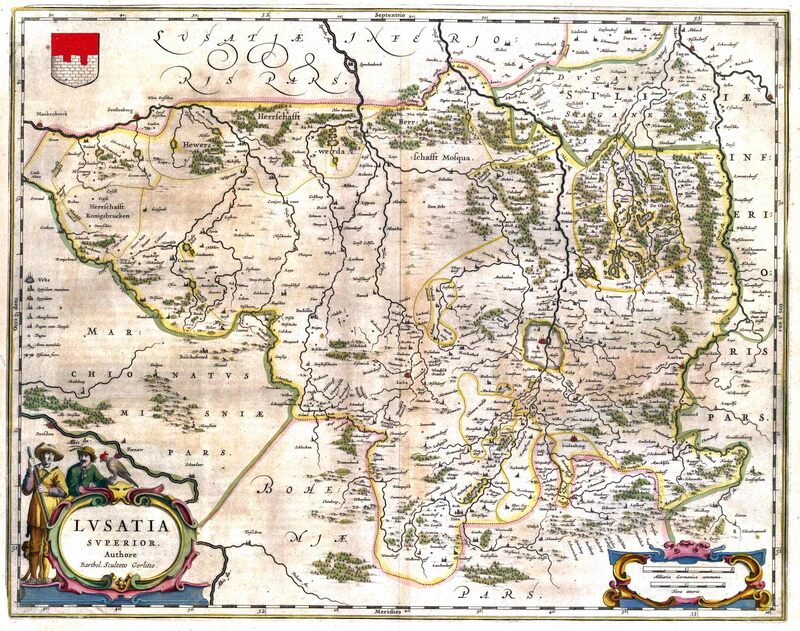 Silesia, with Moravia, was temporarily detached from the Bohemian crown and was ruled by Hungary. 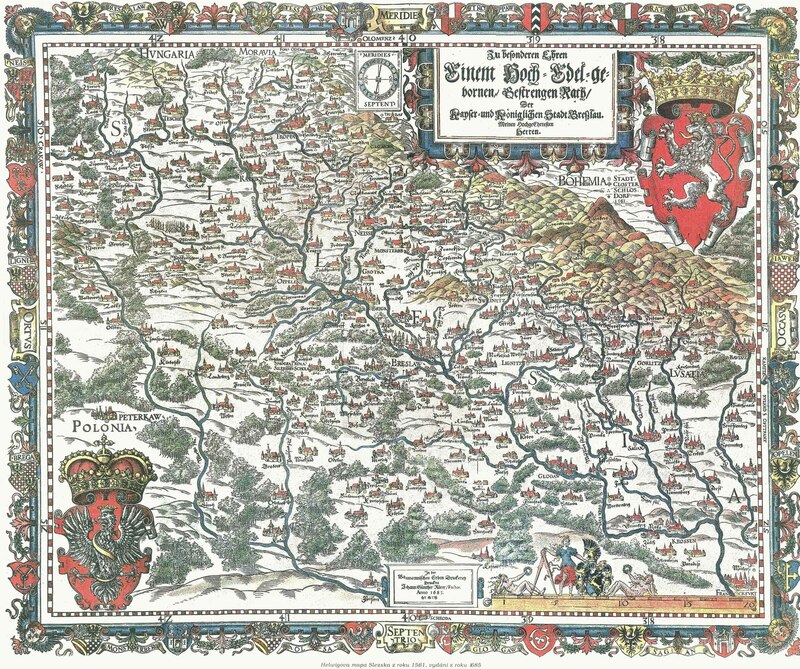 In 1490, however, both Silesia and Moravia reverted to Bohemia, with which they passed to the house of Hapsburg in 1526. 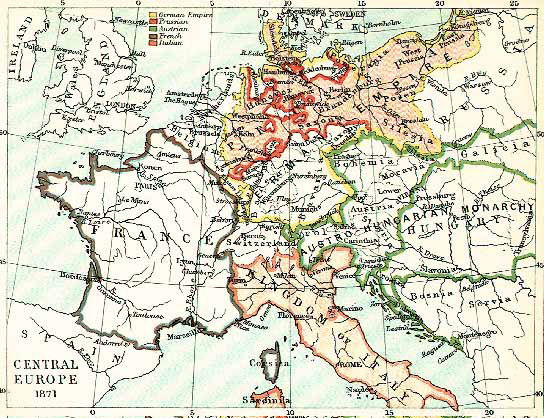 Hapsburg rule and increasing Germanization loosened Silesia's historic ties with Poland. 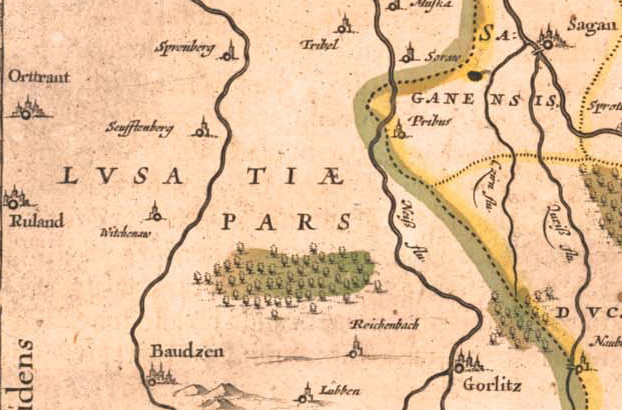 However, the ducal title, along with several fiefs, remained with the Silesian branch of the Piast dynasty until the extinction of the line in 1675. The margraviate of Jägerndorf was purchased in 1523 by a cadet branch of the Hohenzollern dynasty of Brandenburg, which later also claimed inheritance to other Silesian fiefs. Elector Joachim II of Brandenburg, moreover, concluded (1537) an alliance with the Piast duke, by which Brandenburg would inherit the Piast principalities if the Piast dynasty became extinct. This treaty was declared invalid by King Ferdinand I of Bohemia (later Emperor Ferdinand I). In 1621, John George of Jägerndorf, brother of the elector of Brandenburg, lost his fief for having supported Frederick the Winter King. The Thirty Years War (1618–48) brought untold misery to Silesia under successive Saxon, imperial, and Swedish occupation. It reverted to Austrian control at the Peace of Westphalia (1648). 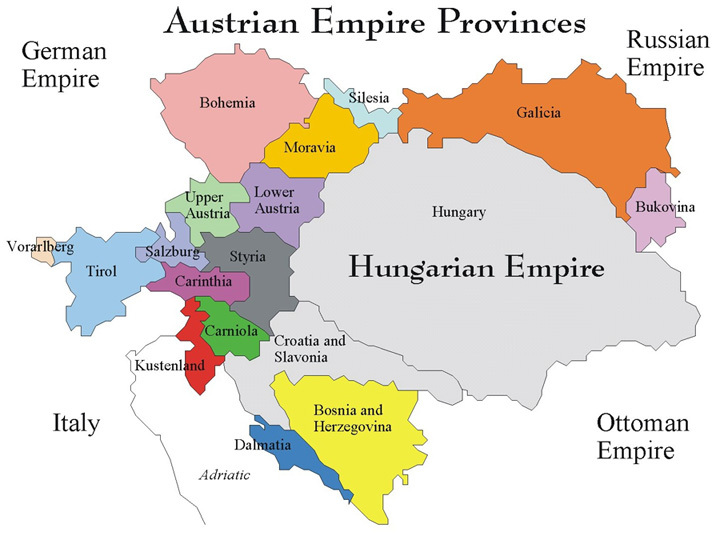 In 1675, on the death of the last Piast, Austria incorporated the Piast territories into the Bohemian crown domain. 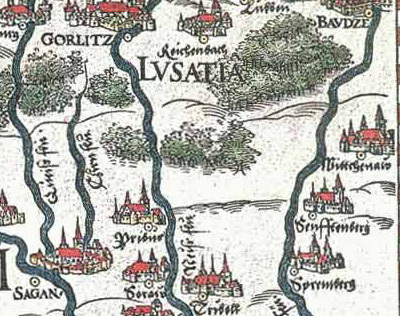 The Counter Reformation had by then made great progress in Silesia, although Lutheranism was tolerated in Breslau (Wrocław) and certain other districts. It was on the very shaky dynastic grounds indicated above that Frederick II of Prussia, as heir of the house of Brandenburg, claimed a portion of Silesia in 1740 from Maria Theresa, who had just assumed the succession to Austria, Bohemia, and Hungary. His claim and his offer to assist Maria Theresa in the impending War of the Austrian Succession were rejected by the queen while Prussian troops were already invading Silesia. The Silesian Wars (1740–42 and 1744–45) were part of the general War of the Austrian Succession. By the Treaty of Berlin (1742), Maria Theresa ceded all of Silesia except Teschen and present Czech Silesia to Prussia; this cession was ratified by the Treaty of Dresden (1745). 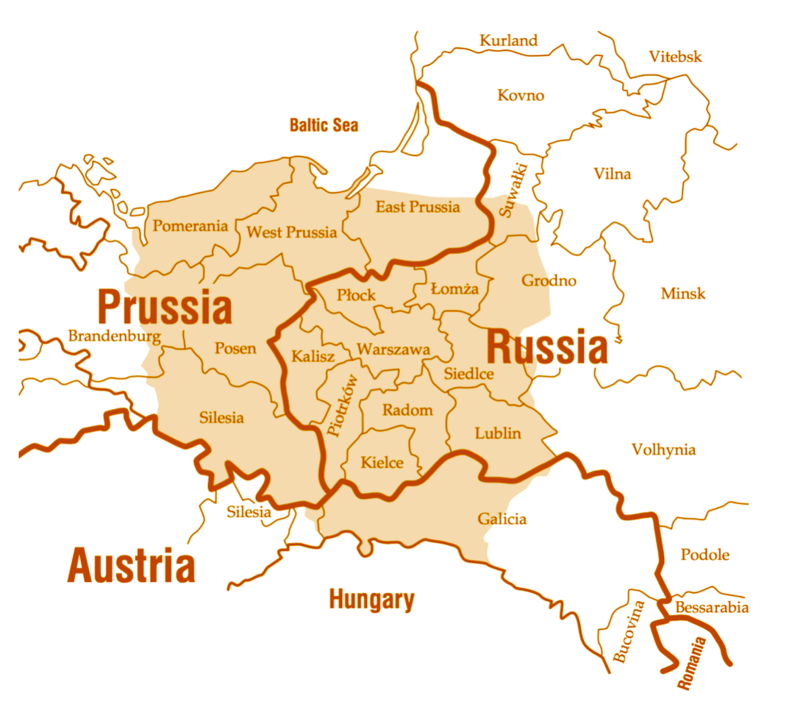 In the Seven Years War, Prussia retained Silesia. During the Industrial Revolution of the late 18th and 19th cent. textile weaving and coal mining developed rapidly in Silesia, but industrialization brought great social tension. The Silesian weavers became dependent on entrepreneurs who farmed out work; working conditions and unemployment became intolerable, and discontent ran high. Most coal mining was in the hands of private industry, under which miners were often mistreated. Landholding conditions also were iniquitous, most of the land being held by owners of large estates. The resulting tensions assumed an ethnic character, since the upper and middle classes were predominantly German, while a large percentage of the workers were Polish. Though these conditions were gradually improved, Silesia even in the 20th cent. remained, despite its great productivity, a relatively backward area. After World War I the Treaty of Versailles (1919) provided for a plebiscite to determine if Upper Silesia was to remain German or to pass to Poland. The results of the plebiscite (1921) were favorable to Germany except in the easternmost part of Upper Silesia, where the Polish population predominated. After an armed rising of the Poles (1922) the League of Nations accepted a partition of the territory; the larger part of the industrial district, including Katowice, passed to Poland. The contested city and district of Teschen were partitioned in 1920 between Poland and Czechoslovakia (to the satisfaction of neither) by the conference of ambassadors. 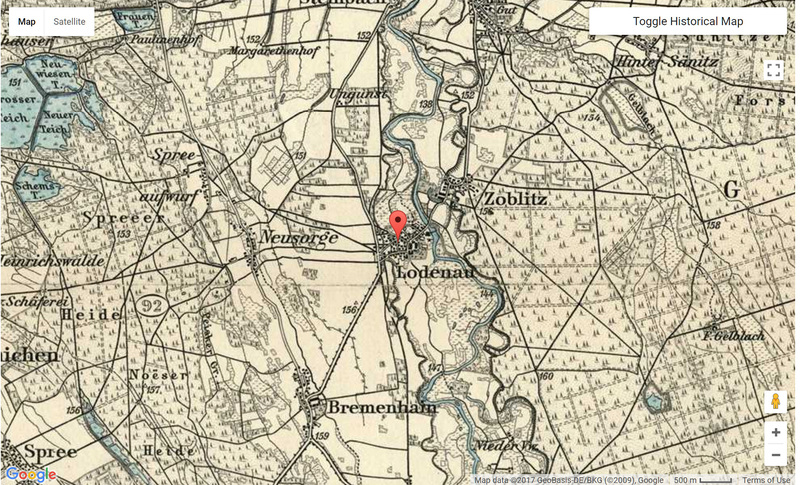 The political division of the Silesian industrial district was carried out so arbitrarily that the boundaries often cut through mines; some workers slept in one country and worked in another. 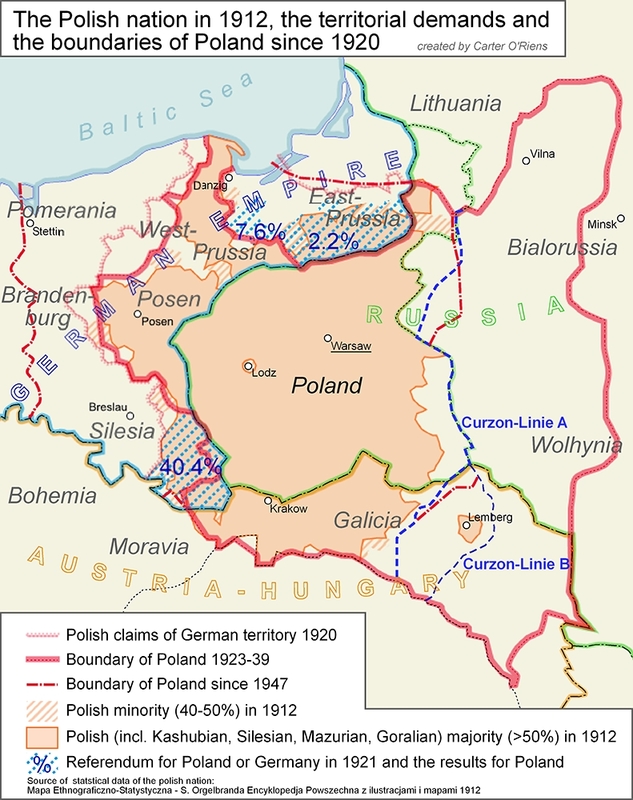 As a result of the Munich Pact of 1938 most of Czech Silesia was partitioned between Germany and Poland, and after the German conquest of Poland in 1939 all Polish Silesia was annexed to Germany. 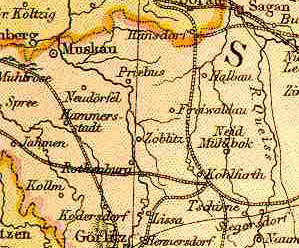 After World War II the pre-1938 boundaries were restored, but all formerly Prussian Silesia E of the Lusatian Neisse was placed under Polish administration (a small section of Lower Silesia W of the Neisse was incorporated with the East German state of Saxony). The Allies also allowed the expulsion (in an “orderly and humane” manner) of the German population from Czech Silesia, Polish Silesia, and Polish-administered Silesia. The mass expulsion of Germans was, perforce, neither orderly nor humane; moreover, although the transfer of territories to Polish administration was made subject to revision in a final peace treaty with Germany, the Polish government treated all Silesia as integral Polish territory. West Germany finally relinquished all claims to the area under the terms of a nonaggression pact with Poland in 1972. With the unification of East and West Germany in 1990, German leaders attempted once again to allay the fears of its neighbors, particularly Poland, by declaring the stability of the borders determined at the end of World War II. In 1742, most of Silesia was seized by King Frederick the Great of Prussia in the War of the Austrian Succession, who in his first declaration to the Silesians named himself a 'Piast prince' (he was in fact a remote descendant). The remainder of Silesia or Cieszyn Silesia stayed within the Austrian Empire. 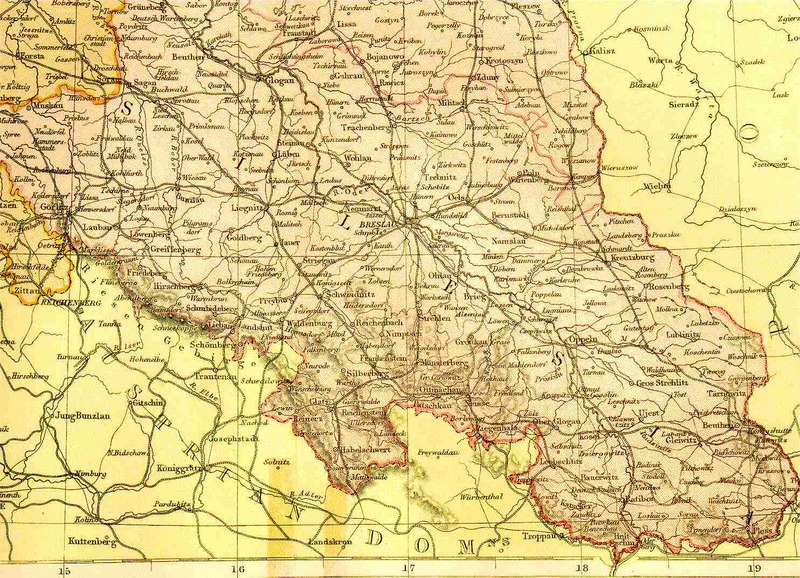 The Prussian part of Silesia constituted the Province of Silesia (later the Prussian provinces of Upper and Lower Silesia) until 1918. The minority of self-declared Polish Silesians, their language and their culture were put under the pressure of the Prussian state's Kulturkampf policies, attempting to make Germans out of them in culture and language too. 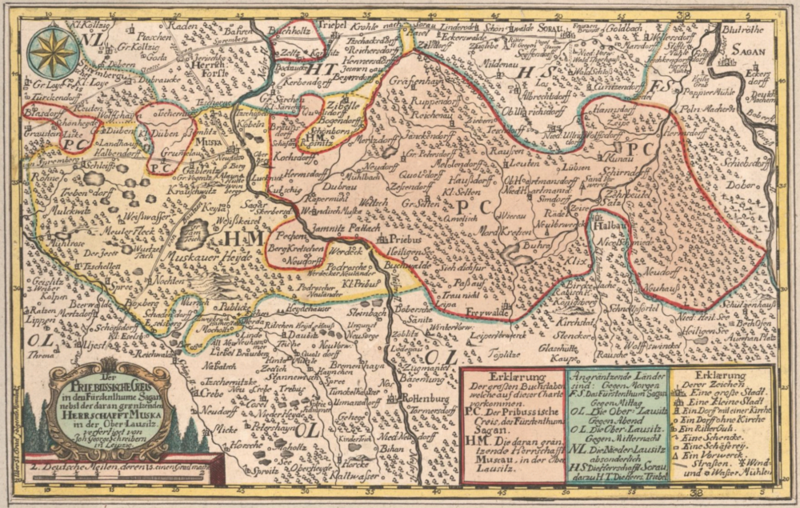 After the Silesian Uprisings the eastern minor, but richer part of Upper Silesia became part of newly restored Poland, the most of the part that had remained under the rule of Habsburgs following the 1742 war came to Czechoslovakia, while Lower Silesia and most of Upper Silesia remained within Germany. Under the care of the Red Cross between 1955 and 1959 some of the remaining Silesians had the possibility to emigrate to West and East Germany for a Family reunification with their families in Germany ... But some had to wait for years. Until 1989 nearly 600,000 Silesians emigrated to Germany. 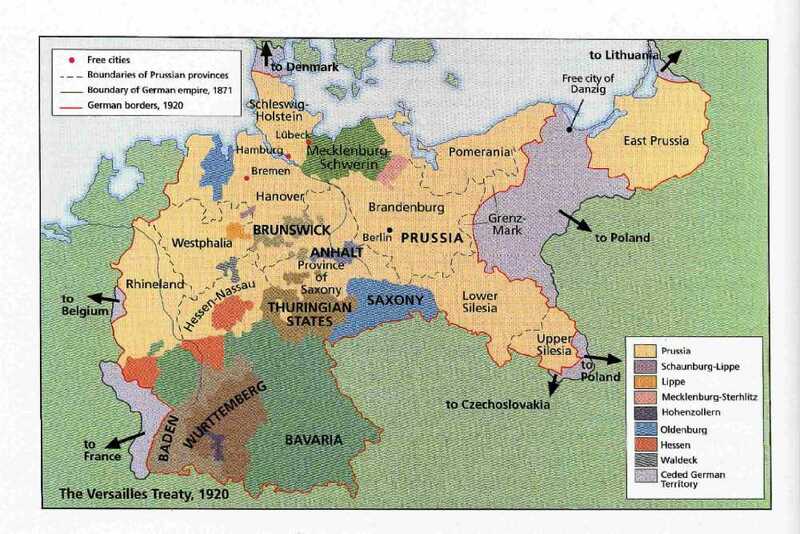 Poland 1815-1918: Poland was divided among Austria, Prussia, and Russia. Lower Silesia (Niederschlesien), to the northwest, includes the valley of the upper Oder, where potatoes, grain, and sugar beets are grown. Upper Silesia (Oberschlesien), to the southeast, is a heavily industrialized area with extensive iron, coal, and other mineral deposits. 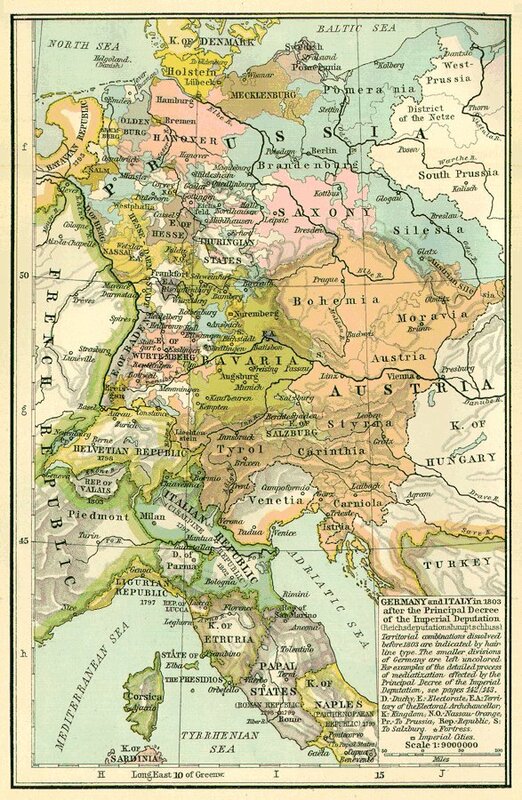 "Description: A map of Germany in 1872, showing the extent of Prussia, the German states which joined Prussia to make the German Empire, and Alsace and Lorraine territories taken from France in 1871 ..."
The pink line is the present border between Poland and Germany. 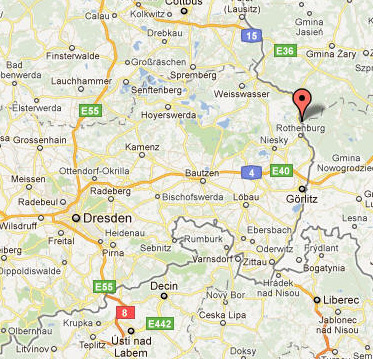 Polish and German names of cities are provided. Please note Rothenburg. Breslau-Stadt, Breslau-Land, Brieg, Frankenstein, Glatz, Gr. Wartenberg, Guhrau, Habelschwerdt, Militsch, Münsterberg, Namslau, Neumarkt, Neurode, Nimpgtsch, Ohlau, Oels, Reichenbach, Schweidnitz, Steinau, Strehlen, Striegau, Trebnitz, Waldenburg, Wohlau. 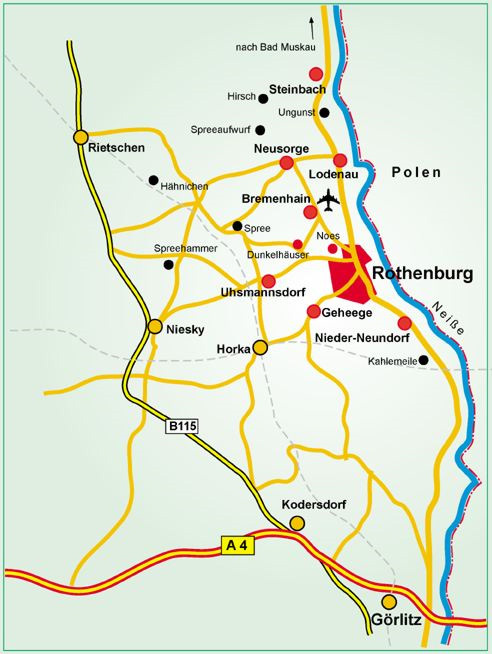 Beuthen-Stadt, Beuthen-Land, Falkenberg, Gr.Strehlitz, Grottkau, Kattowitz, Kosel, Kreuzburg, Leobschütz, Lublinitz, Neisse, Neustadt, Oppeln, Pless, Ratibor, Rosenberg, Rybnitz, Tarnowitz, Tost-Gleiwitz, Zabrze. Bolkenhain, Bunzlau, Freystadt, Glogau, Goldberg-Hainau, Görlitz-Stadt, Görlitz-Land, Grünberg, Hirschberg, Hoyerswerda, Jauer, Landeshut, Lauban, Liegnitz-Stadt, Liegnitz-Land, Löwenberg, Lueben, Rothenburg, Sagan, Schönau, Sprottau. What about the remaining Silesian areas outside Prussia? 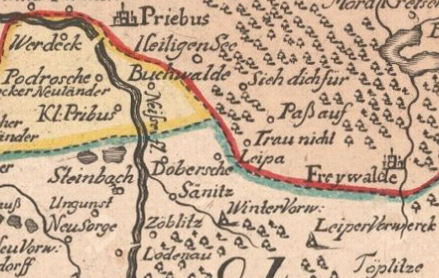 Städte (cities) of Troppau, Bielitz, Friedek. Bezirkshauptmannschaften (land districts) of Bielitz, Freistadt, Freiwaldau, Freudenthal, Jägerndorf, Teschen, Troppau. 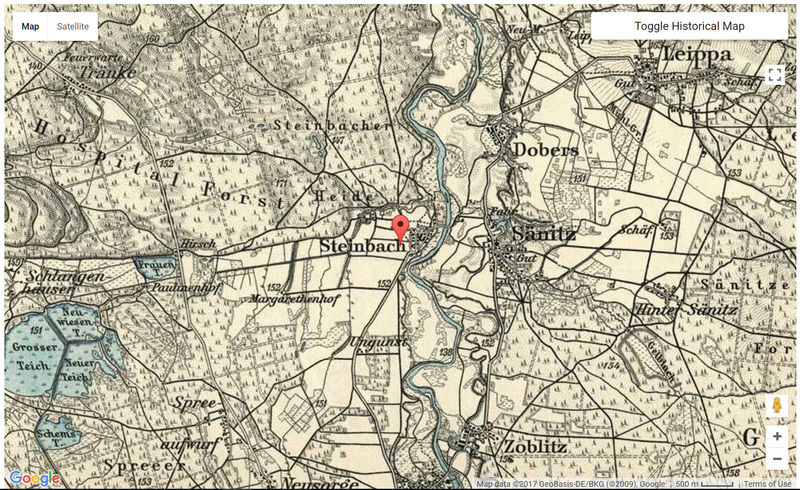 What were the court districts in Schlesien before 1900? The highest Silesian court was the Oberlandesgericht in Breslau with records deposited at the Wroclaw archives today. Beuthen, Kattowitz, Königshütte, Myslowitz, Tarnowitz. Breslau, Kanth, Neumarkt, Winzig, Wohlau. Brieg, Grottkau, Löwen, Ohlau, Strehlen, Wansen. Frankenstein, Glatz, Habelschwerdt, Landeck, Lewin, Mittelwalde, Münsterberg, Neurode, Reichenstein, Reinerz, Wünschelburg. Gleiwitz, Nikolai, Peiskretscham, Pless, Tost, Zabrze. Beuthen, Carolath, Freistadt, Glogau, Grünberg, Guhrau, Halbau, Herrnstadt, Kontopp, Neusalz,Polkwitz, Priebus, Sagan, Sprottau, Steinau. 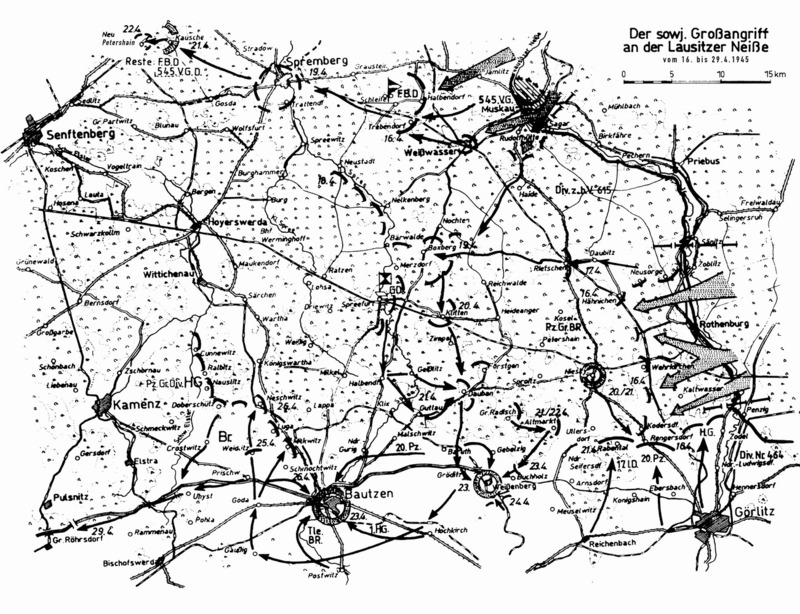 Görlitz, Hoyerswerda, Lauban, Marklissa, Muskau, Niesky, Reichenbach, Rothenburg, Ruhland,Seidenberg. 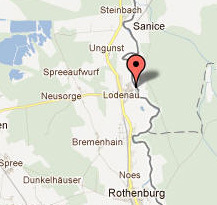 Bolkenhain, Friedeberg, Greifenberg, Hermsdorf, Hirschberg, Lähn, Landeshut, Liebau, Löwenberg, Schmiedeberg, Schömberg, Schönau. Bunzlau, Goldberg, Haynau, Jauer, Liegnitz, Lüben, Naumburg, Parchwitz. Bernstadt, Festenberg, Gr.Wartenberg, Militsch, Namslau, Neumittelwalde, Öls, Prausnitz, Trachenberg, Trebnitz. Gr. Strehlitz, Guttentag, Karlsruh, Konstadt, Krappitz, Kreuzburg, Kupp, Landsberg, Leschitz, Lublinitz, Oppeln, Pitschen, Rosenberg, Ujest. 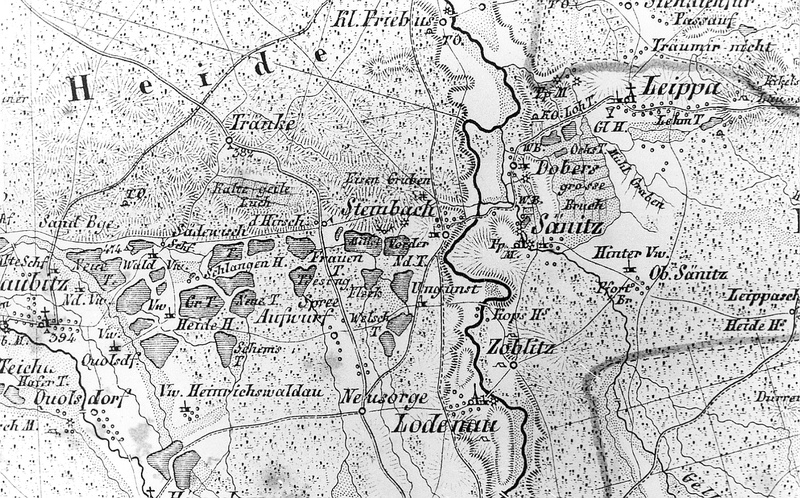 Bauerwitz, Gnadenfeld, Hultschin, Katscher, Kosel, Leobschütz, Loslau, Ratibor, Rybnik, Sohrau. Freiburg, Friedland bei Waldenburg, Gottesberg, Nieder-Wüstegiersdorf, Nimptsch, Reichenbach, Schweidnitz, Striegau, Waldenburg, Zobten. 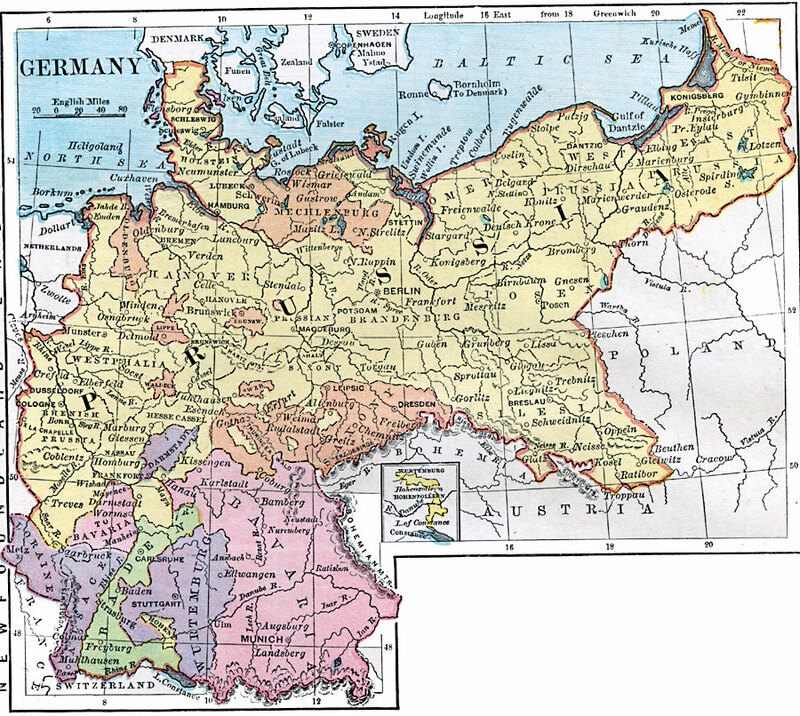 German Silesia. 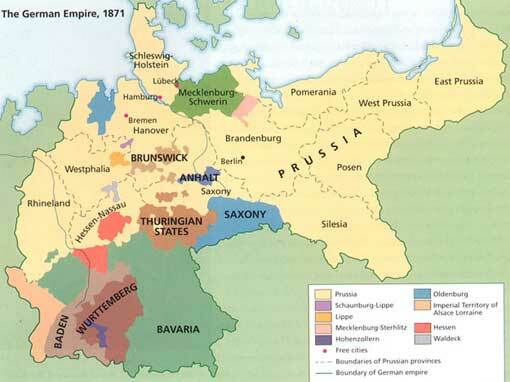 German Silesia is bounded by Brandenburg, Posen, Russian Poland, Galicia, Austrian Silesia, Moravia, Bohemia and the kingdom and province of Saxony. 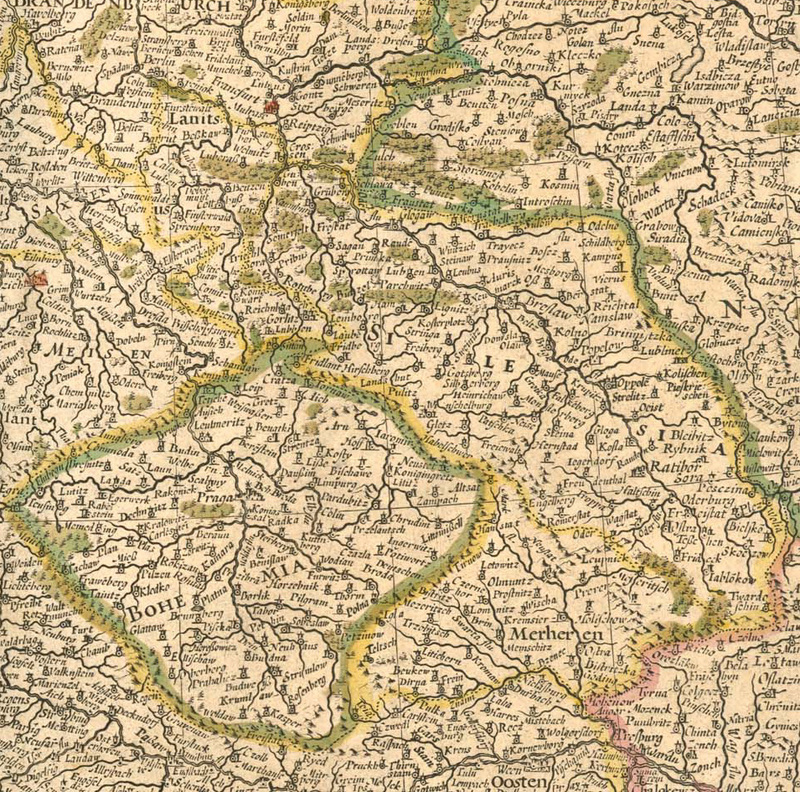 Besides the bulk of the old duchy of Silesia, it comprises the countship of Glatz, a fragment of the Neumark, and part of Upper Lusatia, taken from the kingdom of Saxony in 1815. The province, which has an area of 15,576 sq. m. and is the largest in Prussia, is divided into three governmental districts, those of Liegnitz and Breslau comprising lower Silesia, and of Oppeln taking in the greater part of mountainous Silesia. The Province of Silesia (; ; Silesian: Prowincyjo Ślůnsko) was a province of the Kingdom of Prussia from 1815 to 1919; the territory had been conquered from Habsburg Austria during the 18th century Silesian Wars. The provincial capital was Breslau. 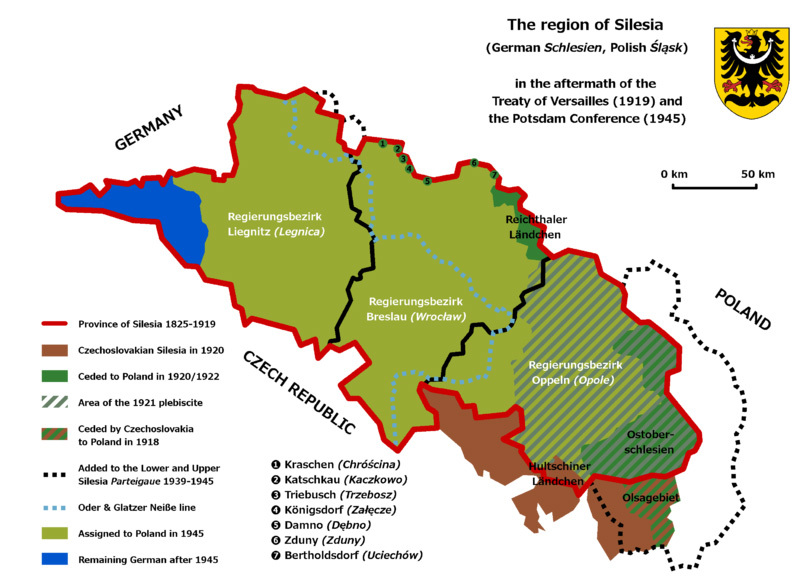 During the Weimar Republic, in 1919, Silesia was divided into the separate provinces of Upper Silesia and Lower Silesia. The two provinces were reunited into a single province from 1938-41. 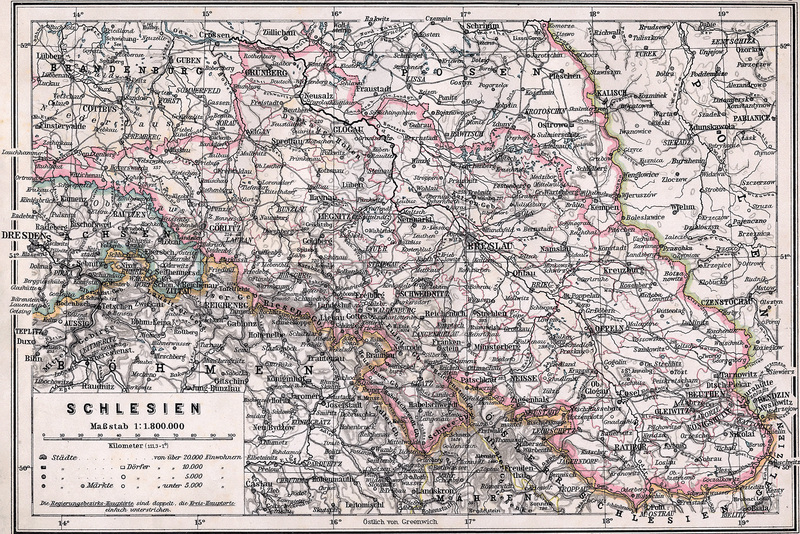 The Province of Lower Silesia (German: Provinz Niederschlesien) was a province of the Free State of Prussia from 1919 to 1945. 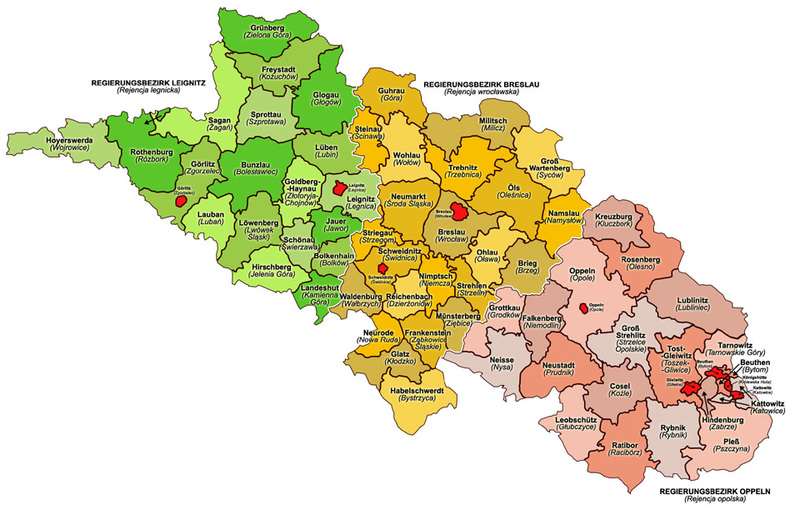 Between 1938 and 1941 it was reunited with Upper Silesia as the Province of Silesia. The capital of Lower Silesia was Breslau (now Wrocław in Poland). 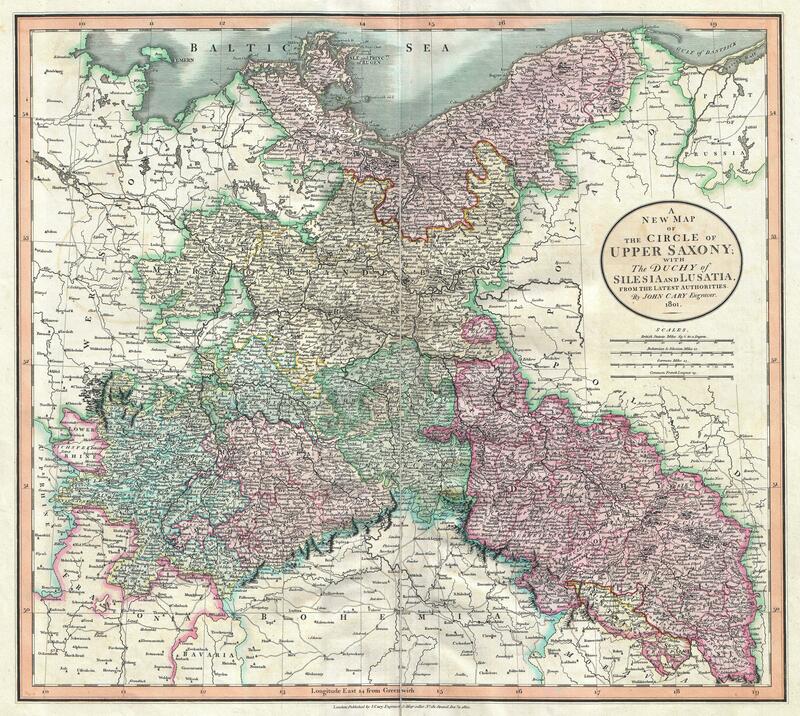 The province was further divided into two administrative regions (Regierungsbezirke), Breslau and Liegnitz. 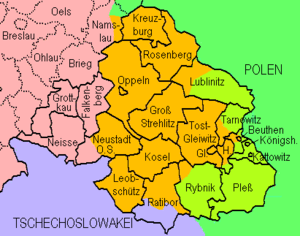 The region of Lower Silesia now lies mainly in Poland, but with parts in the German Free State of Saxony (the Görlitz, Rothenburg/Oberlausitz and Hoyerswerda areas) and a small part in the federal state of Brandenburg.